My Chicken Fried Ribeye recipe is made with thinly sliced ribeye battered and fried to a golden, crispy outside and smothered with a creamy white country gravy that is the perfect contrast to the crunchy steak. I took this recipe a step further and topped it with a perfectly poached egg for a rich, ooey gooey, irresistible twist on steak and eggs. You don't have to be from the south to love this comfort food classic! Several of the Sunday Supper Tastemakers traveled to Kansas this weekend to visit a real working cattle ranch courtesy of Certified Angus Beef® brand. We'll be doing and learning lots of great stuff so be sure to follow #RootsInBoots on social media to join in the fun. During our ranch trip, Kent Rollins of Food Network fame is going to be cooking us some of his famous chuckwagon recipes! I'm just a little excited! If you haven't heard of Kent, you might want to check out this YouTube video to see the famous chef he beat in a chicken fried steak 'throwdown'. That should give it away, but you'll definitely want to check it out. Chicken Fried Ribeye is exactly the same as the southern classic dish usually called Chicken Fried Steak. Chicken Fried Steak is typically made with a cheaper cut of beef that has been pounded thin and tenderized. When I was shopping for this recipe, I came across some thinly sliced Certified Angus Beef® brand ribeye steaks and thought, why not?! Ribeye is one of my most favorite cuts of beef. It is tender and flavorful, so I decided on the spot the ribeye would be ideal for my recipe. I don't always make good decisions, but this time I hit it out of the park! To get a golden, crispy, fried chicken like coating on the steaks, I first coated each steak in cornstarch to ensure the egg wash would stick. This helps the batter to stick to the meat when frying. For the egg wash I dipped the cornstarch coated ribeyes in a mixture of eggs and buttermilk. Then I dredged the steaks in a seasoned flour mixture. Because we like 'em extra crispy, I went ahead and dipped the steaks in the egg mixture and then coated with another layer of seasoned flour. I let the coated ribeyes set on a rack for about 10-15 minutes before frying in hot oil. This also helps to ensure a nice crispy coating that sticks to the steak. For best results when frying, I recommend deep frying in a dutch oven (cast iron if you have it) instead of using a skillet. Deep frying works the best for this recipe. The result is an even golden color with a crisp crust and a beautifully cooked steak that is tender and juicy. Deep frying is also quicker than pan frying and should take about 2-3 minutes total. A white country style gravy seasoned simply with salt and plenty of pepper is very easy to make and a staple in any southern kitchen. White gravy is comfort food y'all! It is addicting and there are lots of different uses for it. A peppery white gravy is essential when enjoying Chicken Fried Steak. The creamy gravy is a delicious contrast to the crispy coated steak and you'll want to be sure to have some buttermilk biscuits on hand to sop up every last drop! 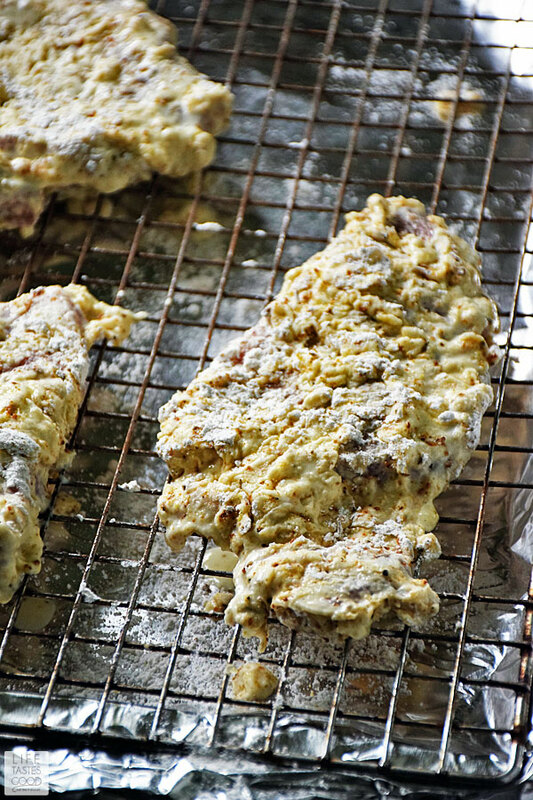 PIN this Chicken Fried Ribeye recipe for later! 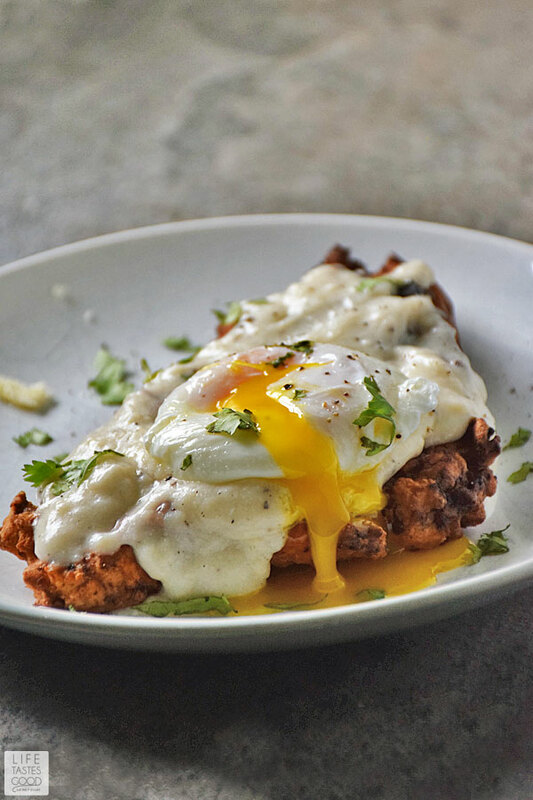 Chicken Fried Ribeye is made with thinly sliced ribeye battered and fried to a golden, crispy outside and smothered with a creamy white country gravy that is the perfect contrast to the crunchy steak. Don't forget a perfectly poached egg on top, because everything's better with an egg on it. Begin by setting up a little assembly. Measure 1/2 cup cornstarch into a medium sized bowl or plate. Next up in our assembly line is the egg mixture. Combine 1 cup buttermilk with 1 egg and 1/2 teaspoon baking powder and whisk to combine. Last, but not least, in a medium bowl combine 1 1/2 cups all purpose flour, 1 tablespoon seasoned salt, 1/2 tablespoon lemon pepper, and 1 teaspoon garlic powder. Whisk to combine. Prepare a resting place for the battered steaks by placing and oven rack on a foil lined baking sheet so the rack sets inside the baking sheet. Place this resting spot at the end of assembly line after the flour mixture. Begin battering the steaks one at a time. First coat the steak in the cornstarch and then dip in the buttermilk mixture and allow excess to drip off a bit, and coat the steak with the seasoned flour. For an extra crispy outside, dip the steak in the buttermilk mixture again and dredge in the seasoned flour again and then place on the rack to rest. Continue until all steaks are coated in the manner and resting on the rack. Allow the steaks to rest 10-15 minutes while you heat the oil. Discard any remaining cornstarch, buttermilk mixture, and seasoned flour mixture. In a dutch oven set over mid-high heat, add enough oil so it is approximately 3 inches deep. You want to be able to submerge the steaks in the oil. Heat the oil over mid-high heat until the oil is about 350 degrees F.
Fry 2 steaks at a time in the hot oil for about 2 minutes or until golden brown and crisp. Remove from the oil to a wire rack and fry the remaining two steaks in the same manner. Drain oil and discard safely. Begin heating the water for the poached eggs over mid-high heat. Strain the eggs to get rid of the thin part of the white. Click here to see a visual of how I strain the eggs using a mess strainer. While the water is heating, start the gravy. To make the white gravy, heat 1/4 cup bacon grease in the dutch oven over medium heat. When the oil is hot, add 2 1/2 tablespoons all purpose flour and whisk to combine. This mixture will start to bubble. Allow to cook about 2 minutes while whisking. Slowly stir in 1 cup milk and allow it come to a gently boil white whisking. Stir until smooth and thickened. Cooking time will vary depending on your desired consistency. Personally, I feel a country white gravy should be on the thick side. Give it a taste and season with salt and pepper. A white gravy generally has a good amount of pepper in it, so keep adding salt and pepper a little at a time, tasting in between additions, until it is to your liking. 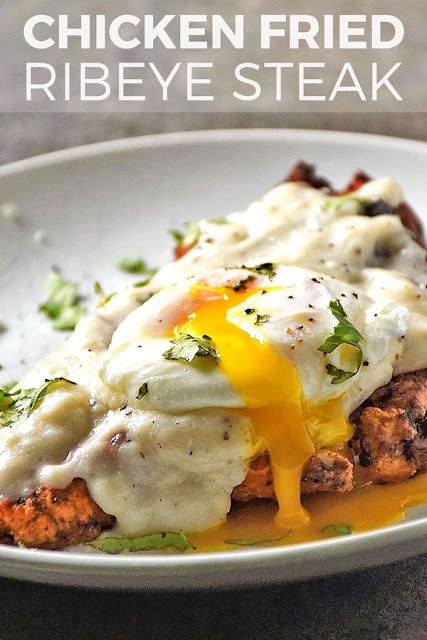 Serve the chicken fried ribeye topped with country white gravy and a poached egg. Enjoy! Ooh Marion that egg puts this dish over the top delicious! This takes steak to a whole new level! YUM! 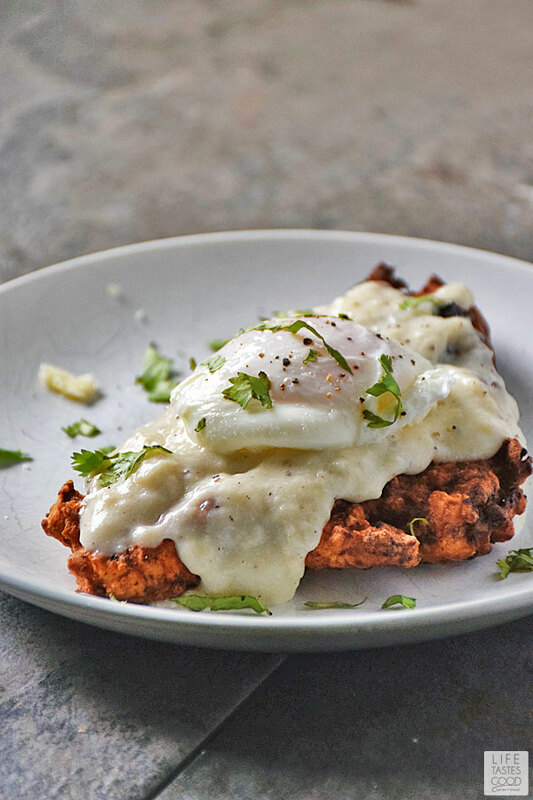 We are addicted to chicken fried steak and this one is gorgeous! Sounds like the perfect family meal to me! This is absolutely mouthwatering! 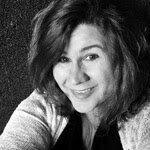 Love your photos and I know the flavor has to be incredible! Ohmygosh. This is like all of my husband's favorite dishes rolled into one- I can't wait to make it for him! 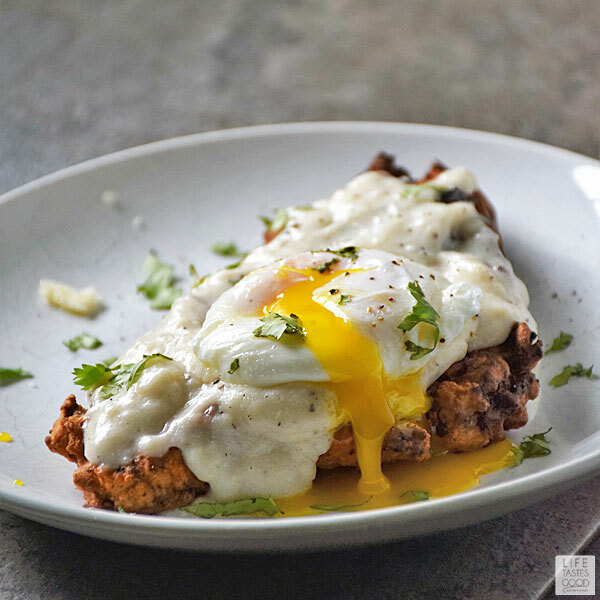 I love the idea of a poached egg on a country fried steak! Genius!! !